This is a super simple, mid-week blue plate special. 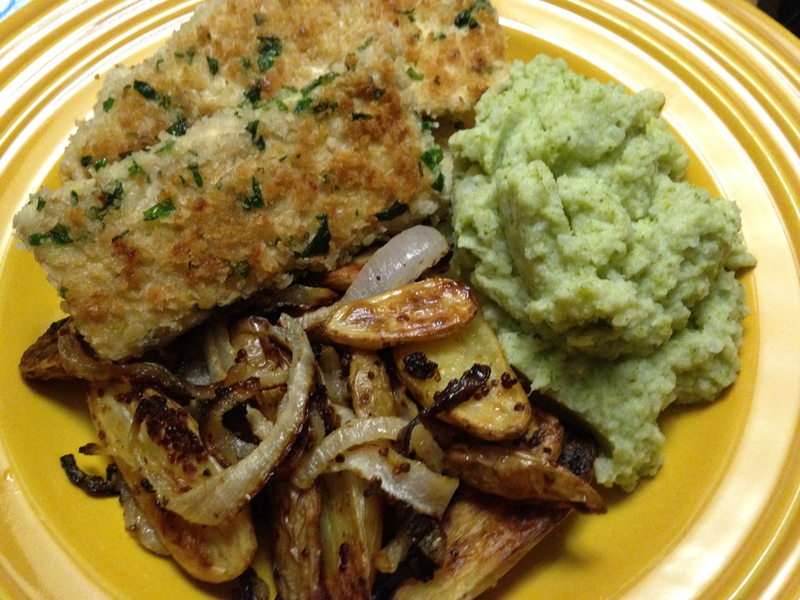 Breading the tempeh with panko makes it super crispy and I love the cauliflower broccoli mash up with the potatoes. The perfect bite is a little of each on the fork! It is a good habit to buy fresh parsley (and cilantro too) and keep it in the house. Fresh herbs really liven things up and make things seem fancier than they really are! Cut tempeh in half, half again, and then into 8 cutlets. Steam in apple juice and tamari for 10 minutes. Let cool. Set up breading station by pouring each element into a bowl. I have no measurements, just use your judgement! Dredge the tempeh in the flour, then the milk and then the panko. Heat up sunflower oil in a non-stick skillet and cook until tempeh is crispy on the first side. Using tongs, turn and cook on the other side. Preheat the oven to 400. Cut the potatoes in half. Slice the onion into semi-circles. In the bottom of a big mixing bowl, whisk the mustard, olive oil, salt and pepper. Throw in the potatoes and onions and toss to coat. Turn out onto a baking sheet, turn the cut side of the potatoes down, and roast until well browned, 40 to 45 minutes. Break up the cauliflower and broccoli. Place in a pot and fill up about halfway with water. Steam until soft. Drain the water and add a spoonful of Earth Balance, a few shakes of nooch, and salt and pepper to taste. Use a potato masher or immersion blender to puree until you get the consistency you like. Taste and adjust seasonings. Mustard potatoes sound good, but what do you do with the onion after slicing? add them to the potatoes!